Pluto’s moon Charon is the best sidekick a dwarf planet could hope for: unwavering in its loyalty, content to be a minor character in somebody else’s narrative. But two years after the New Horizons flyby, the largest of Pluto’s five moons is finally getting some well-deserved time in the spotlight. New research suggests that Charon’s storied history includes tectonic activity, cryovolcanism, and perhaps, a globe-spanning ocean. While Pluto is alive and active geologically, its large satellite Charon, which probably formed during a massive collision billions of years ago, is a crater-covered wasteland whose surface has been ageing for eons. Charon today is dead—but enormous chasms spotted by the New Horizons spacecraft suggests the moon hasn’t always been this way. An ongoing research effort, including a geologic survey published recently in the journal Icarus, affirms that billions of years ago, Charon went through at least one period of tectonic activity, when its entire surface expanded outwards. As described in the study led by NASA planetary scientist Ross Beyer, the Pluto-facing hemisphere of Charon, which New Horizons’ Long Range Reconnaissance Imager saw during its flyby, features two distinct geologic provinces. To the south, the smooth plains of Vulcan Planum, coated in ice that Beyer and his colleagues interpret to be a cryvolcanic “lava flow.” To the north, a vast and diverse area known informally as Oz Terra, whose surface is riddled with grooves, scarps, and deep, elongated, chasms that put Earth’s Grand Canyon to shame. Using craters to age the moon’s surface, the researchers determined that Charon puffed up about four billion years ago. While nobody’s sure why this happened, the authors suggest ancient Charon could have had a global, subterranean ocean, kept warm by energy contained in the moon’s silicate-rich core. As that core heat dissipated, the ocean cooled, froze, and expanded. “It grows in volume, and this pressure is what causes the icy crust above it to crack, fracture, and rift apart,” Beyer told Gizmodo. Such expansion, Keane agreed, could “easily result in the observed tectonics on Charon.” Once freezing was complete, Charon would have become dormant. 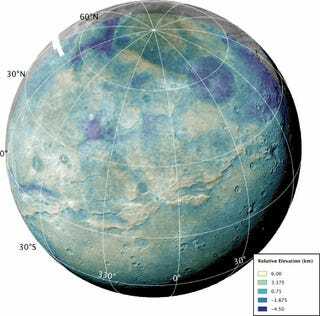 A subsurface ocean could also explain those icy lava flows spotted across Charon’s southern terrain, which Beyer and his colleagues are continuing to study. “What we think happened is that during this period when Charon was expanding and rifts were forming, for whatever reason, the areas in the north pulled apart a little bit, but the areas in the south maybe pulled apart more,” Beyer said. As additional rifting in the south caused chunks of crustal material to sink, alien ocean brine was extruded upwards, oozing everywhere and smothering the surface in ice. Still, the notion that Charon may have had oceans and ice volcanoes hints at the moon’s similarities to Pluto, which might be hiding a vast liquid water ocean beneath its surface. While it’s unlikely we’ll find anything alive and wriggling on either world, these findings expand our understanding of the environments in which some of the conditions for life may exist.